The SEC issued a press release in January 2017 announcing that it had settled books and records fraud charges against Citigroup Global Markets (“Citigroup”) for overbilling investment advisory clients and misplacing client contracts. Citigroup consented to the SEC’s cease-and-desist order and agreed to pay $18.3 million to settle the charges. The SEC’s Order imposing sanctions against Citigroup characterized the case as a books and records fraud. The SEC found that Citigroup had overbilled at least 60,000 clients, between 2000 and 2014, due to inadequate checks and balances related to the entry of clients’ advisory fee arrangements in its computer systems. Those clients had negotiated fee rates different than the default fee rate in Citigroup’s computers. However, the clients were charged the default (higher) rate, rather than the rate that was outlined in their contracts and/or other agreements. Additionally, some clients who temporarily suspended their accounts were still being charged fees during the suspension periods. Some of the errors were initially found and corrected, while others were not. Citigroup admitted that it could not locate the paperwork related to roughly 83,000 advisory accounts that it opened for clients between 1990 and 2012. Hence, Citigroup could not corroborate that the rates clients were charged for services were the same as what it had entered in its computer systems and had been charging them. 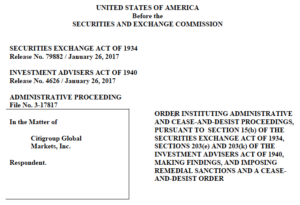 However, the SEC has not made any public statement as to whether this particular case was itself an SEC whistleblower case. The SEC’s Office of the Whistleblower posts Notices of Covered Action (“NoCA”) for Commission actions where a final judgment or order results in monetary sanctions exceeding $1 million. The NoCA list does not disclose if a particular Enforcement action on the list was brought as the result of a whistleblower tip, complaint, or referral being filed with the Commission.